Istanbul Sabiha Gökçen International Airport is located on the Asian side of Istanbul and is one of two airports to serve Turkey's largest city – the other being Atatürk International Airport on the European side. The airport is named after Sabiha Gökçen, the country's first female combat pilot. Our Istanbul Sabiha Gökçen International Airport provides details of airport facilities, transport routes and accommodation options. Information desks are situated in the international (tel: +90 216 588 8585) and domestic (tel: +90 216 588 8686) departures areas. From Istanbul city centre, take the E-80 express highway or the E-5 highway; follow signs for the airport and take the Pendik/Kurtköy exit. Istanbul Sabiha Gökçen International Airport is situated 12km (7 miles) north of Pendik and 45km (28 miles) east of Istanbul. 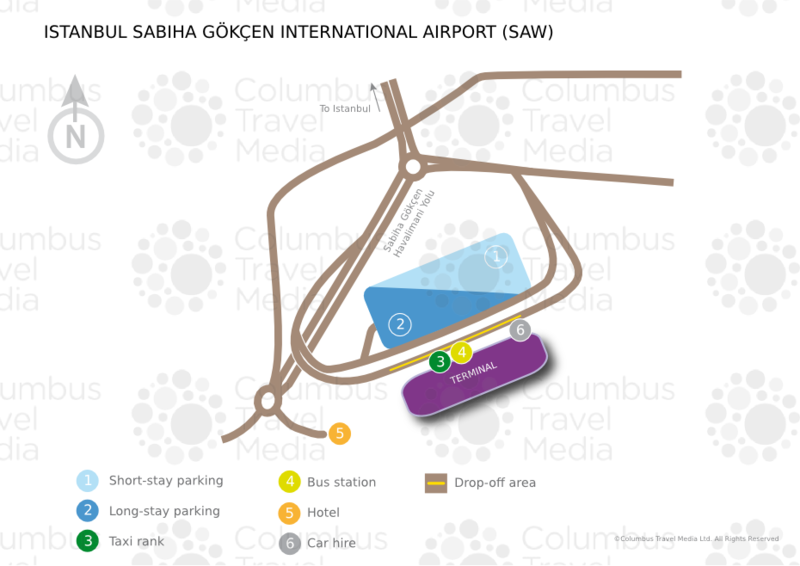 Bus:There are regular bus services (tel: +90 212 372 2222; www.iett.gov.tr) between the airport, the nearest Metro station, and the city centre (journey time: 30-45 minutes); services also connect Sabiha Gökçen International Airport and Atatürk International Airport (journey time: 60-70 minutes). Taxi:Taxis are available 24 hours a day to destinations in and around Istanbul. SAWKOOP (tel: +90 216 304 4127; www.sawkoop.com) offers fixed price city and hotel transfers. The journey time to Istanbul is roughly 45 minutes and the fare is about €45. Water:The IDO Sea Bus Port (tel: +90 850 222 4436; www.ido.com.tr) is situated 8km (5 miles) away; this provides connections to the different districts of Istanbul, as well as to neighbouring towns and cities. There are banks located within the airport, some of which can provide currency exchange services, as well as various ATMs. Restaurants, fast food outlets and cafés can be found throughout the airport. There is a shopping centre in the main departures area and various duty-free shops in the international sector. For lost items, head to the domestic information desk (tel: +90 216 588 8686) on the departures level or alternatively send an email, including a description of lost items, to the airport lost and found office (terminallostfound@sgia.aero). A left-luggage facility (tel: +90 216 588 8802) is available in Arrivals for those seeking to store their baggage. Baggage packing services and paid-for porter services are also available. Other facilities available at Istanbul Sabiha Gökçen International Airport include an ambulance and first aid facilities, in case of medical emergencies, while a pharmacy, located on the first floor, is available for minor ailments and medicines. Multifaith prayer rooms are located in Arrivals. There is a large conference centre on site, large enough to accommodate up to 200 delegates (tel: +90 216 588 8000). More extensive meeting and business facilities are available in the ISG Airport Hotel (tel: +90 216 588 5000; www.isgairporthotel.com), adjacent to the terminal. In addition, there is a Wings VIP lounge in the terminal, along with airline lounges. Paid-for Wi-Fi internet access is available throughout the terminal, along with several fixed internet kiosks. A post office is situated in Arrivals. Facilities for disabled passengers are numerous, including wheelchair hire services, disabled toilets, designated parking and adapted ATMs and telephones. A four-storey car park adjacent to the terminal has capacity for over 4,000 vehicles. Car hire companies Avis, Budget, Enterprise, Europcar, Hertz, and Sixt are represented at the airport: each has offices on the Arrivals floor. Local operators are also represented.